At PJO Brokerage, we help General and Sub-Contractors from all different specialties get the proper insurance for their field every day. Anyone in the construction industry understands that when you are dealing with building projects, there are inherent risks involved. By not only implementing excellent safety policies and seeing that they are followed, but also putting the proper insurance in place, you are able to have that peace of mind that every business owner should have. We provide AZ Contractor’s Insurance to roofing companies, electrical contractors, masonry workers and more. At PJO Brokerage, we understand that in today’s tough economy, especially in the construction industry, you need every edge you can get. Going into a bidding process for any type of commercial or municipal structure means you have to have insurance in place – otherwise you won’t even be considered! Let us assist you in setting up the right contractor’s insurance for your specialty. We will help you figure out the limits on it, as well as deductibles and at a price you can afford. This protects any general contractor, developer or builder as well as your employees and agents against lawsuits, liabilities or any other costs that could result from a claim against the building, or the property. Some examples of these claims could be roofing or electrical failure, leaks or safety issues. Before any construction project is started, you need to have this type of insurance and know about the various components. The term “Contractor’s insurance” is a loose category that includes worker’s comp, general liability, bonds and more. It may come as a surprise that the cost for the insurance you need may not be too expensive. The costs depend on a variety of factors, including the level of insurance required, your annual turnover of people, your workplace safety history, size of company and so on. Scottsdale commercial general liability insurance protects you as a small business owner from ever being in the awful position of being personally or as a business, sued for damages due to some unfortunate event with an employee, independent contractor or even something as random as a vendor. In many cases, it is a requirement in leasing professional office space to carry this type of protection and you will not be able to lease space without proof of insurance. In some rare cases, if you never interact with others for your business and have no employees (such as maybe you do direct phone sales from home, and you are your own business doing this for several companies as an independent contractor) then you may be the rare exception that does not need to carry General Liability. When you choose your policy with a professional insurance broker, we will sit down and assess your business with you and view the potential risks for the business as well as location and office equipment, number of employees and more. We will help you determine how much coverage the business will need and discuss the pros and cons of this coverage and whether or not more is needed so you are fully protected. For example if you cap your liability insurance at $1 million and someone successfully sues your company for $1.5 million, your company would be then liable for the 500,000 difference. If this is an eventuality you do not want, we will make sure the cap is high enough to likely prevent this scenario. Be prepared of course to spend more, as with any insurance, for the higher amount of coverage. The purpose of setting up bonding insurance with PJO Brokerage is to provide extra protection and financial backing in the unfortunate eventuality of being unable to meet your financial obligations in a project. For example if you have third parties or laborers you have hired to perform work, and then for whatever reason, a client does not pay you, and you are stuck with third parties to pay without making money, this can protect you. Your clients are generally expected to pay for the cost of the premiums on performance and payment bonds. When bidding for a job, include the cost of the bond in the bidding price. The cost is usually anywhere from 1% to 3% of the total contract price. In the case of a small job such as a minor home improvement job, it is impractical to obtain a bond. For many larger jobs, having a bond will be a requirement to get started. A word of caution is that once work has begun, generally you cannot get a bond. It is something that must be done beforehand. Additionally, as a contractor, your client must include this in the contract if this is something he wanted, and cannot present it to you after the fact of awarding a bid. (Obviously, since the cost of the bond will need to be absorbed by the client, and included in the bid as part of the cost of the project). 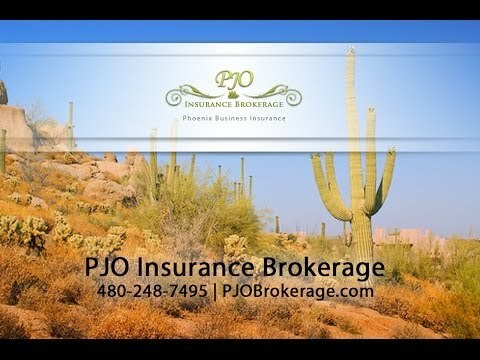 When you come to PJO Insurance Brokerage, we will be able to help you with all of your questions so you get the type of bond you need. You can trust that we will be able to give you the expert guidance required to protect your company in today’s litigious atmosphere with bonding insurance in Cave Creek! When you are doing roofing, you know that you are doing a risky job. Not having roofers insurance In Cave Creek and Scottsdale puts you, your workers and any of your clients at a tremendous risk both physically and financially. If one of your workers is seriously injured and does not have personal health insurance, and you don’t have roofer’s insurance, what happens to them? You will need to cover their medical bills – potentially to the tune of hundreds of thousands of dollars. Not a pretty picture. While nobody wants to bear the expense of having to pay for insurance, let’s be honest, it’s a necessity in this day and age. You have two separate facets of roofer’s insurance. One of which is worker’s comp and the other is public liability. In a nutshell, worker’s compensation covers your employees, independent contractors and all third parties working on your project. Public liability covers any and all members of the general public who may be around your jobsite, should anything unforeseen happen to someone. If you’ve been around the construction industry for any length of time, chances are you have heard horror stories. Having insurance does not make an unfortunate event a happy circumstance but it can resolve things so it is not the end of the world – and not the end of your business either! While you may be able to “wing it” on low paying, small contract jobs without roofer’s insurance, you will never be able to land bigger jobs and major municipal or corporate bids without it. At PJO Brokerage, we do understand that these expenses are no small matter for contractors to bear and we will help do our best to help you find the most cost effective solutions for your business.